Extended Control for Sunset, Riverside, Volante, and More. Want instant access to three presets for Sunset or Riverside? Or to unlock the full potential of Volante? Connect MultiSwitch Plus with the included 1/4″ TRS cable and add a new dimension to your rig. MultiSwitch Plus can be configured in several different ways to extend floor control of compatible Strymon pedals. Depending on the selected mode and the pedals connected, you can recall presets, change banks, operate TimeLine’s looper, remotely tap tempos, and more. See compatibility chart below. Control up to Three Pedals. Featuring three outputs, MultiSwitch Plus allows you to connect up to three compatible Strymon pedals using additional TRS cables (sold separately). Now you can engage presets on Sunset, Riverside, and Volante simultaneously. Or mix and match the footswitches to set up your own custom operation—such as controlling tap tempo on your Flint, Favorite on your El Capistan, and Boost on your Riverside. Add a MultiSwitch Plus to your Sunset, Riverside, or Volante and gain instant access to presets 1, 2, and 3. Or connect all three pedals to MultiSwitch Plus using additional TRS cables (sold separately) to access three synchronized presets on all three pedals simultaneously. Connect MultiSwitch Plus to Volante for additional footswitchable control. Use MultiSwitch Plus for remote operation of the SPEED switch, remote transport control, or for additional foot control while in Sound on Sound mode. Use MultiSwitch Plus to remotely toggle Volante’s Speed switch. Instantly alter the speed of the media, changing the fidelity and creating layered multi-octave textures. Volante provides the unique ability to reverse, pause, and infinitely repeat the delayed sounds. MultiSwitch Plus opens the door to even more immediate and expressive control of these functions. MultiSwitch Plus provides remote access to three of Volante’s Sound on Sound functions. When in Sound On Sound mode, MultiSwitch Plus allows control over infinite repeats, pause, and reverse functions. Not only does MultiSwitch Plus give you full control over TimeLine’s Looper in a simple, compact format, it also unlocks three additional looping features: Reverse, Half Speed, and Undo/Redo. Use MultiSwitch Plus to control your TimeLine Looper in two different ways. MultiSwitch Plus allows instant access to TimeLine’s Record/Overdub, Play, and Stop functions without holding the TAP switch to enter Looper Mode. Easily access looping features while retaining footswitch control over your delay sounds. Hold TimeLine’s TAP switch to enter looper mode, and MultiSwitch Plus now gives you instant access to Reverse, Half Speed, and Undo/Redo. Gain access to a versatile, 6-button looper that is excellent for live looping and experimentation. MultiSwitch Plus provides an alternate way to explore presets and set tempos on your TimeLine, BigSky, and Mobius. MultiSwitch Plus gives you a new means of exploring preset banks. Use the left switch to move down a bank, right switch to move up a bank, and middle switch to cycle through your presets within the current bank. A great way to explore all of your presets. Use MultiSwitch Plus to recall the perfect preset on your TimeLine, BigSky, or Mobius. Easily scroll through saved presets using the left and right switches, and engage/bypass the preset you have selected with the middle switch. Use MultiSwitch Plus to scroll through your saved presets and control your tap tempo all at once. Perfect for TimeLine and Mobius–use the left switch to scroll down through your saved presets, the right switch to scroll up, and the middle switch to tap in the perfect delay tempo or modulation speed. 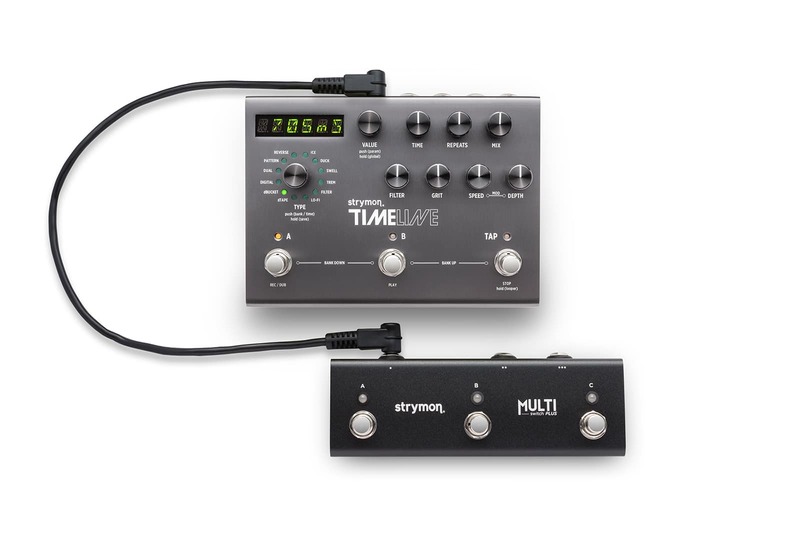 Have multiple Strymon pedals with specific remote control needs? MultiSwitch Plus allows you to independently assign footswitch functions. Tap in tempos remotely on your BigSky, Deco, DIG, Flint, Mobius, Timeline or Volante. Select the favorite preset on your Brigadier, Deco, DIG, El Capistan, Flint, Lex, Riverside or Sunset. Remotely engage the Boost function on your Riverside. Remotely toggle the Fast Rotor Speed on your Lex. Tap/ Fav/ Boost/ Speed Mode Each footswitch is paired with the closest output and its function can be independently assigned. Combo Mode Footswitches A and B will select between presets 1 and 2 for pedals connected to outputs 1 and 2. Footswitch C can be used for remote tap tempo, favorite, boost, or speed for the pedal connected to output 3. What is the difference between MultiSwitch Plus and MultiSwitch? MultiSwitch Plus offers all of the functionality of MultiSwitch, but provides additional compatibility options, three outputs for connecting multiple Strymon pedals, and LEDs. Yes, MultiSwitch Plus comes with one 1/4″ right angle TRS cable. Can’t I use a MIDI controller to access some of these functions? Certainly—if you’d like, you can access these features using MIDI. MultiSwitch Plus is geared towards those that don’t want or don’t need to use MIDI in their rigs. MultiSwitch Plus is connected via a standard TRS cable and does not require a separate power supply. Do I need to update the firmware on my TimeLine, BigSky, Mobius, Sunset, Riverside, or Volante to use MultiSwitch Plus? In some cases yes. Please visit strymon.net/update for information on how to check your firmware version, and how to update your firmware. All TimeLine, Mobius, and BigSky pedals built as of February 1, 2019 will ship with firmware that is compatible with MultiSwitch Plus. If your TimeLine, Mobius, or BigSky was built before this date then it will require a firmware update. How do the LEDs function in the different modes? Depending on how MultiSwitch is configured, the LEDs indicate the currently loaded preset or the status of the Boost or Speed setting for connected pedals. The LEDs do not function in Timeline, BigSky & Mobius mode because communication with TimeLine, BigSky and Mobius via the EXP jack is not bi-directional. Custom mode LED functionality varies depending on the connected pedal and how it is configured. What pedals are compatible with MultiSwitch? Please see Compatibility Chart above.